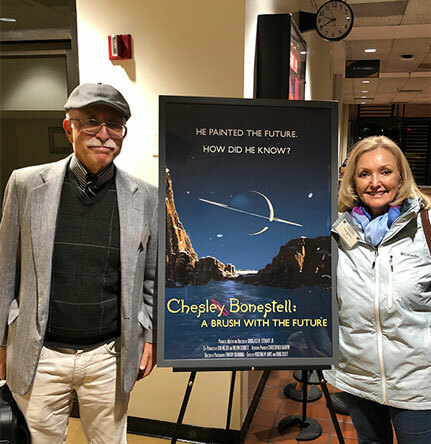 So Resident Astronomer Peggy and I drove to CSULB student center to attend a screening, sponsored by the local AIAA chapter, of the new documentary film titled, Chesley Bonestell: A Brush with the Future. We met up there with Gravity Guy, Ken, and Math Whiz, Dave, and settled in film and later discussion with the film's production team. Good to see everyone here, Ken and Dave! I recall hearing and learning just a bit about Bonestell perhaps four years ago. One of the earliest paintings that I saw at that time is called "Saturn from Titan", which was first painted in 1944 and adapted many times since then and is used in the documentary poster shown below. That imagined view of Saturn as it might be seen from Saturn's moon Titan, is one of the first paintings that I recall seeing in about 2014. Do you recall when you first encountered any of Bonestells paintings or writings? Many of you may have discovered his writings and early paintings in magazines and on the front cover of many issues of Colliers, Sunset and Life Magazine in the 1950's. His reputation is that of a space artist, but his work in architecture and movies also gained a lot of notice. He was the architectural artist on the team that designed many well known buildings including the Chrysler Building in NYC, which came complete with gargoyles, He was also very instrumental in winning approval to build the Golden Gate Bridge in San Francisco. When the early plans for the bridge included some paintings of what the bridge would look like were deemed too ugly for the bridge to be built, Chesley was called in to prepare some better artistic drawings, all completely in tune with the engineering drawings, which enabled the public to see and understand how the bridge would be built and what it would look like after it was built, and only then was approval given to go ahead and build the bridge. He also did many matte paintings for the movies in Hollywood and was called on to work on scifi movies like Destination Moon, War of the Worlds, When Worlds Collide and even a movie about an architect, The Fountainhead. Thanks for all that, Chesley! He also teamed up with Willy Ley and Wernher Von Braun to author books on the conquest of outer space and the exploration of Mars and colonization of the Moon and other planets. Bonestell did not think of himself as a scifi artist, but more of an illustrator. 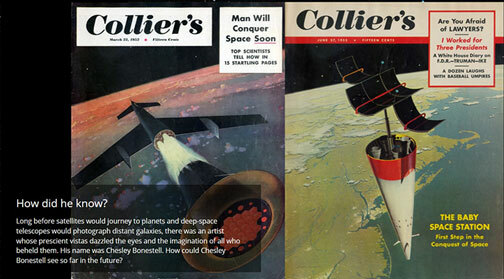 The Conquest of Space came out in 1949 and the Exploration of Mars came out in 1956. Hmm, I don't recall that I ever read either of these books. But, his vision about what life in space would be like turned many folks toward an interest and career in space activity. Both books and others that concentrate more on his art are still available on Amazon if you want to check them out. 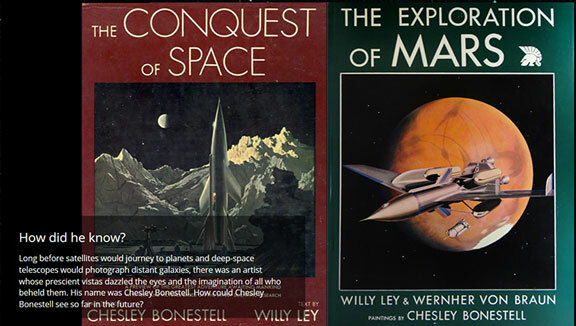 I have a copy of the book "The Art of Chesley Bonestell" by Ron Miller nd Frederick Durant, which the friendly AI algorithms at Amazon tell me that I purchased the book in 2014, but haven't referred to it here because I can't find in which stack of books the book is hiding in! The documentary film provides many details about the life of Bonestell. How he was born in 1888 and grew up in San Francisco and liked painting and didn't have much interest in continuing with his architectural studies but after the 1905 earthquake, he wanted to help rebuild the city and returned to architectural drawing and painting. The film has interviews with a couple of dozen people who were influenced by him. He retired to Carmel, CA and continued to paint his entire life and he died there in 1986. I found the that 1.5 hour documentary film was just fabulous. I think we all really enjoyed it and it was entertaining and informative. I was not really aware of his very productive life and how much he influenced the interest in space exploration. The lead members of the production team were there to answer questions and encourage all of us to spread the word about the film. 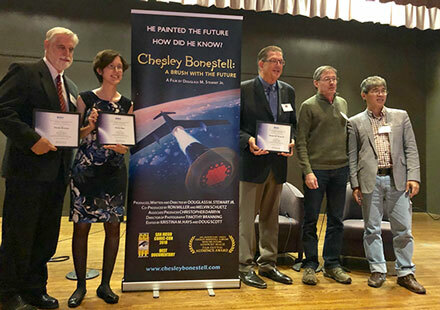 The photo below shows on the left, Director of Photography, Timothy Branning; Editor, Kristini Hays; and Writer, Director and Producer, Douglas Stewart, Jr; and two AIAA meeting coordinating committee members. In trying to recall when I first saw any of Bonestell's paintings, I remembered watching Buck Rogers on TV, but one of the earliest scifi movies that really affect me, scared me really, was "Earth vs. the Flying Saucers", which came out in 1956. Do you remember seeing this old movie? I still remember how the saucers would spin and take off and when they landed a little column would descend and support the disk so it wouldn't touch the ground and the characters could walk underneath the saucer and then be brought up inside. Also the death ray would pop out from the bottom. Luckily some Earth scientists recovered a fallen alien and by re-engineering their ray gun weapon the Earth held the saucers at bay. But a disembodied sounding voice from the saucers said that they would return and that Earth should "look to your sun for a warning." Ooh, that was so scary. I don't remember what the warning was to be or what it might look like, but I thought that I, now, should go out myself and look at the sun to see if something was up. 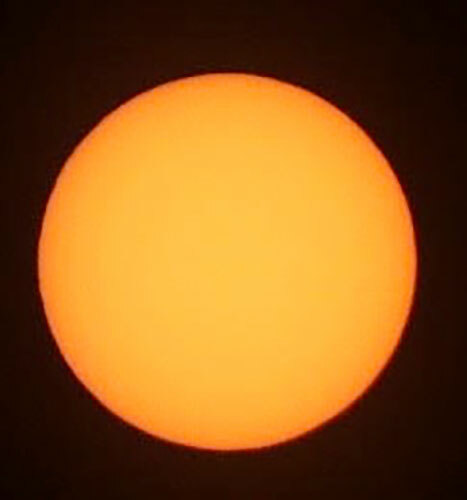 Well, it turns out that at least in the visible band, the sun is pretty quiet. No sunspots or anything. 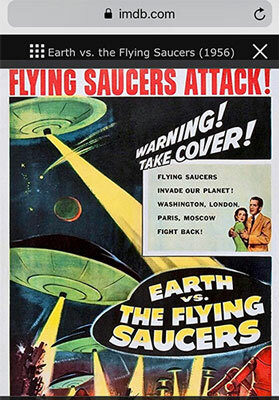 I hope that in terms of the flying saucers that means we are still safe! 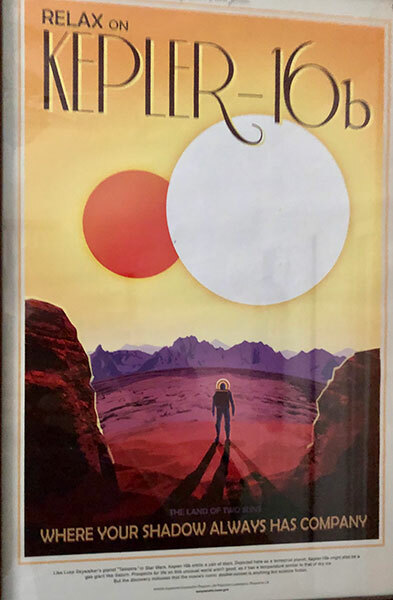 Finally, I have one piece of space art that I picked up at a space conference held a couple of years ago. The artists' image of a space explorer standing on a planet like Kepler 16b and observing the binary star system that makes up the sun in that planetary system and seeing two shadows. That was my moment to be influenced by present day space art. So, we can still keep dreaming about space exploration and space artists will help keep alive and foster that desire. 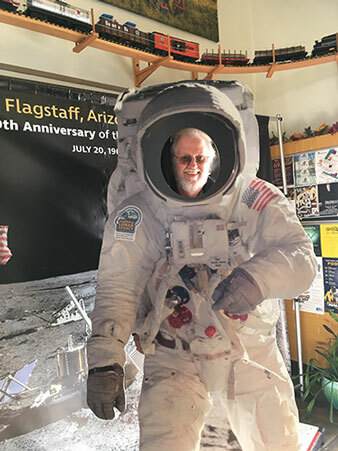 For me, I couldn't resist trying out the astronauts suit photo opportunity during our recent visit to Flagstaff. My only complaint about the opportunity was that the visitor center setup was made primarily for younger and smaller space enthusiasts, but that didn't stop me from trying it out and I had to bend down and lean so far forward to fit into the suit that I almost fell over frontward. Hmm, that would have not done much to keep my space enthusiasm going! P.S. I even put 50 cents in the coin slot to activate the train on the overhead tracks for 2 minutes. No frustrated inner child here!